Regrettably, the celebration of Max Evans’ 94th birthday at Bookworks has been cancelled due to illness. 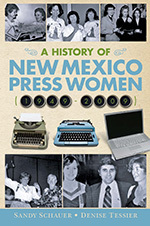 Originally scheduled for Sunday, August 26, this was to be the first in a series of “Salute to Legends” sponsored by New Mexico Press Women with support from associated organizations. The next (now, inaugural) event in the series will be a tribute to Tony Hillerman on Saturday, May 25, 2019, the 94th anniversary of his birth. Plan to come and hear comments by Anne Hillerman, Tony’s daughter, and James McGrath Morris, the author of an upcoming biography of Tony. This entry was posted in Uncategorized by Loretta Hall. Bookmark the permalink.